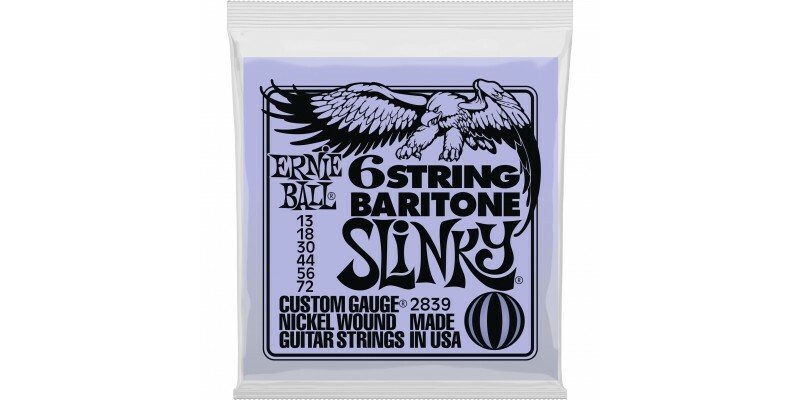 The Ernie Ball 6 String Baritone Slinky Guitar Strings 2839 has small ball ends. They range from 13-72 gauges. Ernie Ball are one of the most famous names in the guitar world. These baritone guitar strings are made from nickel plated steel wire. The Ernie Ball 6 String Baritone Slinky Guitar Strings have been wrapped around tin plated hex shaped steel core wire. It delivers a great balanced sound for your baritone guitar.